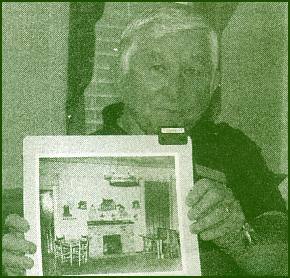 Local historian Joe Head holds up a photograph of the "hillbilly" artwork above the mantel in the Basin Park Hotel of one of Eureka Springs' most colorful citizens: Virginia Tyler. They started reminiscing even before they sat down to lunch at the Crescent Hotel, five citizens who grew up in Eureka Springs and experienced the Basin Park Hotel's - and the town's - heyday of the last century. The five: Joe Head; his sister, Genevieve Head Bowman; Floyd Pendergraft; former Historical Museum Director June Westphal and Bobby Ball shared memories and told stories over lunch while a video camera captured the informal meeting. They were invited by Basin Park Hotel Concierge Anne Kay Axtman who, together with local historian nancy Wood, are preparing a book on the Basin Park Hotel Centennial, which will be a fundraiser for the Historical Museum. For three hours the old friends reminisced about the early days of the hotel and town. June had brought early photos of the hotel. They talked at length about the dances at the hotel and how it really was "the place" to be. 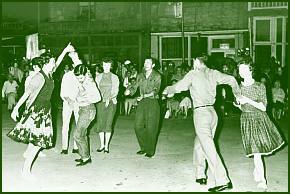 "The dance bands came every summer right in the middle of the Depression," June said. 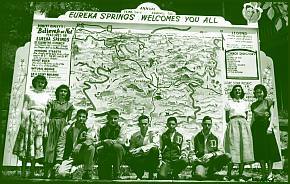 "Things weren't dea in Eureka." Genevieve recalled current Congressman John Paul Hammerschmidt attending all the dances in the 1920s. She once double-dated with him. "Oh, he was handsome! I would have gone anywhere with him!" She was at the first Barefoot Ball, a tradition which continues to this day as part of the Folk Festival. They talked about early jobs they had, at the hotel, at the theater, at the barbershop. Bobby recalled when the infamous Joe Parkhill ran the hotel and the many scandalous stories connected with him, from robbing the slot machines during the gambling era to taking restaurant bills and money. "I said, 'Joe, don't you know you own this hotel, and you don't have to steal from it?' He said, "It wouldn't be the same.' "
Joe Head remembers when Sheriff Dweese "came and busted up the slot machines, and the ladies from the church stood outside and clapped." That was in 1955. They also talked about Claude Fuller and his ownership of the hotel and the bank, and how he had his hand in nearly everything. Bobby ran a taxi and tour service and a lot of people came to Eureka from Monett and St. Louis, Mo, Chicago, IL and other places. They'd come in on the train. It was a bustling time. Genevieve remembers when John Phillips Sousa came here to play for the opening of the Auditorium. "I didn't have a clue who he was," she said. "I was walking down the hill to go to the Auditorium because everyone else was going and the mayor picked me up and took me the rest of the way." They reiterated how much a big part of the town the Basin Park Hotel was. "It was really a drawing card," said Joe. "A lot of people came because of Ripley's Believe It or Not said it had seven floors and every one was a ground floor." "To me, it was the hotel," Genevieve said. "The dances were really the main focus. And it was a place to work." "The Basin Park Hotel was always open from day one," said Floyd, who drove a limousine for the hotel in his youth. "It survived fires. It had things doing that that attracted people, and it was always clean and well-run." "The Basin Park Hotelalways belonged to us in the community," said June. "It was in the heart of town. The Crescent was more for the tourists. The community had banquets (at the Basin Park) and used it on a more ongoing basis. 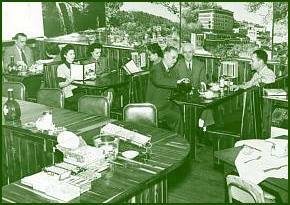 Eating meals at the coffeeshop was part of daily life." "It was the place to eat for the locals," Floyd said. Axtman said the hotel has named some suites after its famous and infamous owners: the Claude Fuller Suite and the Joe Parkhill Suite - with a slot machine. "I'm glad you all are celebrating it this year," June said. "The Basin deserves it." Long after the camera was turned off and this reporter had to leave, they were still reminiscing about the town and the hotel. 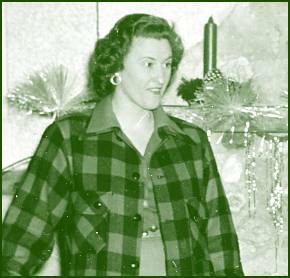 Virginia Tyler in front of the fireplace in the lobby of the Basin Park Hotel. Christmas decorations are visible on the mantle behind her. Virginia Tyler, One of Eureka Springs' "Most Colorful Citizens"
Virginia Tyler was know for her community-minded activities, her ukelele playing, her columns for the Times-Echo, and her alleged preofession - which was not talked about in polite society. She lived in the Basin Park Hotel for many years and "entertained" traveling salesmen, among others. Square dancers took over the street of downtown Eureka Springs Saturday night as dozens of onlookers filled the sidelines. The dancers all agreed, their toe tappin' activity is a great way to enjoy the Summer Ozark Mountain air. The Coffeeshop in the Basin Park Hotel is a way of life for locals in Eureka Springs and a great place to eat for tourists as well. Diners can enjoy such Ozark favorites as Rainbow Trout, Catfish Fillets and Fried Chicken while relaxing in the warmth of the cedar lined walls and bar. Visitors have been flocking to Eureka Springs to see the Basin Park Hotel with its seven floors all on ground level, after the unique building was featured in Ripley's Believe It or Not.